Deli-kun: Riho-chan, can I ask you something? Sayashi: What is it, Deli-kun? Deli-kun: Starting this year, “’14” was added to Morning Musume’s name, right? Sayashi: That’s right. Starting this year, I’m Morning Musume ’14’s Sayashi RiFOUR. Please treat me well. Deli-kun: Hold on! You’re Sayashi RiHO, right? You said “RiFOUR” just now. You’re attaching “’14” even to your own name? Sayashi: I did no such thing. Deli-kun: No, you did say it. Say it one more time. Sayashi: Sure. I’m Morning Musume ’14’s Sayashi RiFOUR! Deli-kun: You totally said it just now. Sayashi: Please stop fooling around. I did not say it. Deli-kun: Am I the one who’s wrong…? 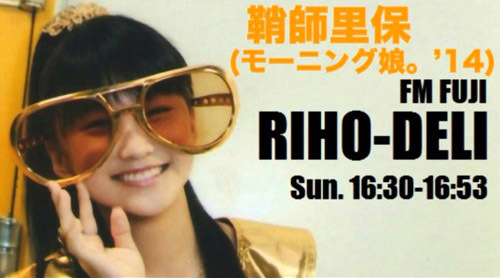 Sayashi: Every Sunday at 4:30 p.m. RIHO-DELI will be brought to you by Morning Musume ’14’s Sayashi RiFOUR! Be sure to listen, ok?! Sayashi: Hello, I’m Morning Musume ’14’s Sayashi Riho! Deli-kun: Do I have to? Deli-kun: Listeners probably don’t know why I’m envious…You just came back from your Hawaii trip, right? Deli-kun: All I can say is that I’m envious! …Alright, fine. Please tell us about it. Sayashi says they did a lot of photoshoots and filming, so it was a pretty long stay. Of course, one of the main things was the fan club tour. Sayashi finds it a little strange to be able to meet the fans in Hawaii. She thinks it’s great that they get to enjoy a fan club event with a different atmosphere. This time was Michishige-san’s last one, so the members and fans prepared a surprise for her. There were also the usual solo corners for each member as well as the optional tours, so it felt really fulfilling. Being with the fans in a different atmosphere and doing things like dancing with them allowed her to see another side of the fans. She feels like the distance between the members and the fans got a bit shorter. When it comes to Hawaii, Sayashi thinks the food is great. They got to go to a lot of restaurants and she ate a lot. Sayashi goes on about how good and thick and juicy the steak was at Wolfgang’s Steakhouse. Deli-kun knows the restaurant and says he’s never eaten there himself and has only seen pictures. He sounds very envious, so naturally Sayashi tortures him with more descriptions of the oh-so-delicious food until he begs her to stop. “It’s the last day of August!” Sayashi thinks there are probably a lot of students out there who are rushing to get their summer homework done at the last minute. She can totally relate, and she hopes that RIHO-DELI can help them keep their energy up. During the summer vacation, Sayashi says she had a lot of photoshoots. One of them was with Juice=Juice’s Miyamoto Karin. Up to now, they’ve never done anything with just the two of them. Sayashi says she was very nervous, especially because Karin is the same age as she is and is also very conscious about being an idol. Sayashi heard that Karin wakes up every morning at 6 to get ready. Then there’s also the image of her being perfect: not only does she have fair skin and a cute and pretty appearance, she’s also good at singing and dancing. When the day of the photoshoot finally came, both of them were really awkward with each other. Sayashi says that normally, they don’t really talk to each other much. Plus, they’re both the kind of people who prefer to be alone even within their own groups and they don’t really go out of their way to socialize with members of the other groups. As a result, the photoshoot was really awkward. The staff told them, “The atmosphere’s interesting today. It’s a new feeling!” and tried to make it sound like a good thing, but Sayashi thinks they were just being considerate and were actually thinking how awkward and unpleasant it was. Deli-kun: But it’s not like you were glaring at each other or something, right? Sayashi: No, it wasn’t like that. Sayashi being “awkward” with Karin-chan-san. Sayashi says they were both just being very polite with each other. Because Karin-chan was in Hello Pro Kenshuusei before she herself joined Morning Musume, even now, she’s not entirely sure which one of them should be considered the senior. Sayashi recalls how they appeared together in a stage play when she had just joined Morning Musume and Karin-chan was still a Kenshuusei. At the time, Sayashi didn’t know what to call her, so she ended up calling her “Karin-chan-san.” After that, calling her “Chan-san” became a habit among the fans and it soon became Karin-chan’s nickname. All of these things have contributed to their complicated relationship, and now when they talk to each other, they use a mix of honorific speech and casual language. Sayashi says things like this make her envy members who are more assertive. This made her realize that even though she enjoys being by herself, when she’s working, she should try harder to expand her personal connections. “It’s hot!” Sayashi reminds everyone to take care of themselves in this heat. Continuing her talk about Michishige-san last week, Sayashi says that she gets nervous when talking to her. She says the other members get nervous as well. On the other hand, there’s Katsuta Rina, aka Rinapu, who gets along really well with Michishige-san. Sayashi thinks that Rinapu is the kind of person who can get along well with anyone. Sayashi herself doesn’t often initiate conversations with members of the other HP groups, but Rinapu comes and talks to her. She says they’re close and that they often talk to each other. What amazes Sayashi is that Rinapu is able to interact with Michishige-san in the same way that she does with Sayashi and the other juniors. What’s more, at a recent HP concert, when Morning Musume ’14 and Smileage were in the same dressing room, Rinapu came up behind Michishige-san, who was doing her makeup at the time, covered her eyes, and said, “Guess who~!” Sayashi couldn’t believe what she had just seen. To Sayashi, that is something that she could never ever do in her life. And yet Rinapu just went and did it. Sayashi says she was both surprised and very envious that Rinapu can act so casually with Michishige-san despite not being in the same group. Deli-kun: How did Michishige-san react? Sayashi: She was like, “Rinapu~! Stop it~!” They looked like they were having so much fun. I couldn’t help but be envious. Sayashi says she also gets envious whenever she sees other MM members having fun talking to Michishige-san and that Michishige-san probably thinks they’re cute. However, Sayashi finds it hard to be forthcoming and initiate conversations with her. Deli-kun points out that Michishige-san will probably be happy if she does it, just like how Sayashi is happy when Rinapu comes up to talk to her. Deli-kun: Do it! This is a mission to play “Guess who” with Michishige-san. Sayashi: “Guess who”…That…I won’t do yet. Sayashi: *in a soft voice* I…I won’t. “August is here!”, as Sayashi quite helpfully reminds us. She asks us listeners if we’re having a good summer so far, and strongly suggests that we ought to make the best of it by going to the beach, to the mountains, to summer festivals, and more! Speaking on the topic of midsummer and the H!P concerts that come with it, Sayashi tells a recent story of when she was staying at a hotel due to them having a concert far away from Tokyo. Usually when the group is staying in a hotel they sleep either in single or double rooms, but this time it just so happened that Sayashi was given a room with three other members: Fukumura, Ikuta and Kudo. Sayashi says she’s often called “untidy” whereas the other three staying with her were members who are generally thought of as quite neat and cleanly. Thus, while she was looking forward to hanging out with the three of them, she was also worried she might get called out by them on her filthy messiness. But unexpectedly for Sayashi, it was actually the other three who were just kind of lazing around and leaving things messy, to the point where she even started telling them to clean up after themselves. Sayashi was actually really happy she got to be in that role for a change, and afterwards she even boasted about it to her manager. Her manager expressed doubt, saying Sayashi’s the type of person who’ll definitely screw something up because it was an unusual situation for her, suggesting that she probably forgot something in her room or something similar. Sayashi replied she was sure she had all her stuff, but when they checked out and arrived at the concert venue, she realized she didn’t have the juice she’d bought while they were staying at the hotel — she’d forgotten it in the refrigerator. It reaffirmed Sayashi’s previously held opinion that she will never be perfect when it comes to this kind of thing. Deli-kun (the show’s pet/co-host) says that while he wouldn’t have expected anything less from Sayashi, he still would’ve preferred the story to have a happy ending. Sayashi claims that her fans would probably be really worried if Sayashi suddenly became all neat and cleanly. Deli-kun disagrees.